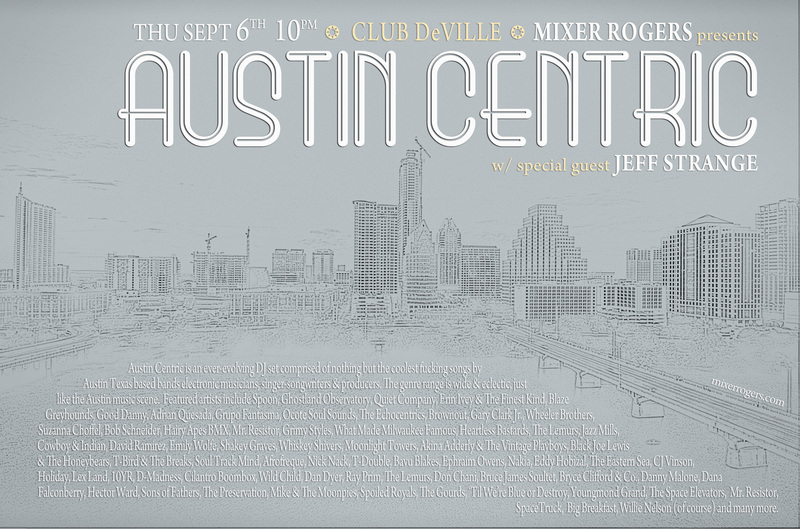 The next AUSTIN CENTRIC is Thu Sept 6th at Club DeVille. I will be joined by my main man Jeff Strange on the turntables. And of course you get the one Will Rhodes running sound. The show kicks off at 10pm and we will rock it until 2am. Come on out and hear all your favorite Austin Texas music all mushed together in the funkiest possible way. NO COVER! This entry was posted in Shows and tagged Austin, Centric, Club, DeVille, DJ, Mixer, Music, Rogers, Show. Bookmark the permalink.